...you get crystal mushrooms and water umbrellas. For those of you who inquired, I use an electric water valve to make these pictures. Using an electronic circuit, I pulse the valve open twice, with a small time delay (about 90 milliseconds) between the two pulses. 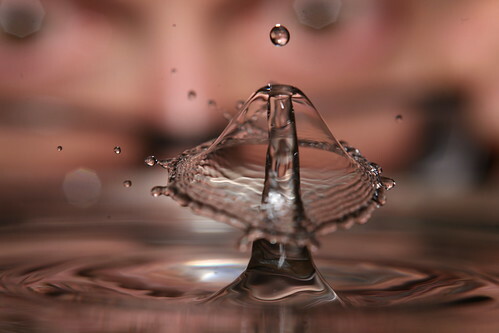 The first resulting drop hits the water in a dish below, shooting a water drop upward. The second drop collides with the first drop a short distance above the dish. I use an optical sensor to trigger the shutter and flash to capture the moment. The dripping repeats every few seconds and I capture about 30 to 40 pictures this way automatically.